Paul steals the diamond ring from the box and pockets it. When Roy comes to see Billy wondering if he accidently put his mother’s valuable ring in the jumble bag Gemma is suspicious. She confronts Paul but he has already sold it to ‘Big Garth’ a market trader for £200. When Gemma points out it was worth £3k Paul heads off to the market with Gemma running after him. Paul warns Gemma that if she grasses him up to Roy he will tell Chesney about her past. At the market stall Garth refuses to hand over the ring so Gemma and Paul break into his van to try and find it and end up locked in the back! When Johnny reveals Eva has asked him to go and visit her and Susie in Brighton Jenny insists he must go. Once he’s left she proceeds to get blind drunk and stumbles around the bar, convinced everyone is staring at her and talking about her she throws everyone out of the pub. Abi tells an incredulous Sally and Tracy that she is going to go sailing with Peter. Tracy warns Peter not to lead Abi up the garden path and let her down gently. When Rita confirms that she won’t be buying the Kabin as it would break Maria’s heart if she demanded her money back, Brian is given food for thought. Gemma is shocked when Paul starts to panic inside the van. She calls Emma and Chesney to enlist their help and distract Garth so they can escape. When Emma clocks how Gemma hugs Chesney to thank him she realises that they should be together and finishes with him to set him free. Chesney and Gemma snog. Meanwhile Gemma and Paul bury the hatchet and admit they have missed each other. Peter tells Abi that he is not looking for a sailing companion, but ever hopeful Abi tells Sally that with Peter not due to set sail for three months she is sure she can change his mind. Having heard about Jenny’s meltdown Liz lets herself into the pub. How will Jenny react to be faced with her nemesis? Meanwhile an excited Brian suggests to Cathy that they should buy the Kabin. When Cathy agrees, Brian is overjoyed. It’s the day of the court case and Liz is fretting about Jenny. Steve insists it is up to the judge to decide her fate. Johnny returns from Brighton to find Jenny in bits. Gemma asks Imran to help but he says nothing will stop the case other than if Liz doesn’t turn up. Desperate to help Jenny, Gemma blags her way into Liz’s flat, what is she up to? When Shona and Bethany discover that Nick and David are looking to hire some ‘totty’ for the customers to ogle at they vow to get revenge. An excited Brain and Cathy head over to tell Rita that they are buying the Kabin but are thwarted when she furiously announces Norris has sold the shop from under her, unaware that they are the buyers. Chesney’s disappointed when Gemma agrees to meet him for a drink at dinner time but fails to show up. Shona visits Clayton in prison to tell him his dad has died from an overdose. She realises he already knew and he says he is being bullied and wants her help to get him moved to an open prison. How will David react when she tells him Clayton needs her help? David and Nick conduct interviews with a set of gorgeous girls but are taken aback when one of the applicants Andrea turns out to be an Italian man. Shona and Leanne are furious with their misogynistic behaviour and insist they reconsider and employ Andrea. Steve is worried when the police turn up at the Rovers looking for his mum as she has not turned up in court. What has happened to her? Brian and Cathy reveal that they’re the new owners of the Kabin. Rita’s furious that they went behind her back and chucking the keys at them, tells them she’s resigning with immediate effect. Finally, Gemma apologises to Chesney for standing him up and assures him that her feelings towards him haven’t changed. Johnny tries to reach out to a fragile Jenny but will she accept his help? Shona enlists Imran’s help to look at Clayton’s request for a move but he doesn’t hold out much hope. Meanwhile Nick is furious with Shona and tells her that she has no regard for David’s feelings, David is angry with Nick for interfering. When Shona tells Clayton that a move is unlikely he shocks her with his response. When Gemma suggests they have a night in with a takeaway, Chesney’s delighted. Brian struggles to run the Kabin single handed and Cathy urges him to make up with Rita. Roy shows Peter some of his mother’s jewellery and asks his advice as to which piece Carla might like. When Roy enthuses about the boat and how it reminds him of his childhood, Peter offers to show him round. Brian calls at Rita’s flat and begs her to return to the Kabin. Cathy calls in the Kabin and is surprised to see Rita behind the counter. Brian explains that Rita kindly agreed to return on condition she was made manager. Carla is worried when she returns from a business trip to find Roy obsessing about an inscription he has found on his mother’s ring. Johnny and Jenny finally talk openly about their relationship and the mistakes they have made and vow to move forward united. Chesney gets a babysitter so he can keep Gemma company on her shift. 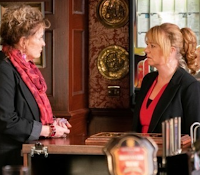 With Jenny and Johnny away Gemma asks Emma to take over the bar whilst she and Ches have some alone time in the cellar.